– Unlike traditional dress or athletic stockings and socks, compression stockings use stronger elastics to create significant pressure on the legs, ankles and feet. Compression stockings are tightest at the ankles and gradually become less constrictive towards the knees and thighs. By compressing the surface veins, arteries and muscles, the circulating blood is forced through narrower circulatory channels. As a result, the arterial pressure is increased, which causes more blood to return to the heart and less blood to pool in the feet. – Compression stockings are a specialized hosiery, designed to help prevent the occurrence of and guard against further progression of venous disorders such as edema, phlebitis and thrombosis. Compression stockings are elastic garments worn around the leg, compressing the limb. This reduces the diameter of distended veins and causes an increase in venous blood flow velocity and valve effectiveness. Compression therapy helps decrease venous pressure, prevents venous stasis and impairments of venous walls, and relieves heavy and aching legs. – In order to work properly, compression stockings must fit correctly and contain the appropriate level of compression. Whether you are buying off the shelf compression stockings or require more specialized products, the staff at Right Fit Medical can help. 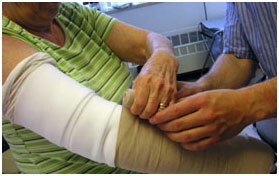 We will work with you and/or your physician to ensure the proper fit, use, maintenance and care.